Being the city manager of almost any city is considered a temporary job, and that is because the job life expectancy of most city managers is between three and six years. Emilio Gonzalez is definitely between a rock and a hard place, and it's evident that given a choice between doing what he and everyone else knows is the right thing by requesting the State Attorney to open an investigation into the allegations that Carollo has violated both the provisions and the spirit of Section 4(d) of the City Charter or holding on to that $265,000 a year salary, plus benefits, Emilio has grabbed on to that paycheck and decided to ride the bucking bronco in the hopes that he can hold on until - and if - Francis Suarez becomes Strong Mayor, and then continue collecting that big paycheck as the City of Miami's Chief Operating Officer, while Suarez is the one who will have to deal with Carollo directly. So here is how the Family and Friends Plan is being played. Local businessman Bill Fuller filed an ethics complaint against Carollo, and before he withdrew that complaint, the Commission's investigators managed to interview enough people that gave evidence in support of Fuller's complaint. Even though Fuller withdrew that complaint, the information that the Commission collected should have been enough for them to initiate their own investigation. The Ethic's Commission regularly opens investigations on anonymous information, so to open an investigation on information that they had acquired from another investigation should have been a cake walk. It does not appear that the Ethic's Commission has opened a new investigation into Carollo, or his alleged violations of Section 4(d) of the Charter of their own volition. in the Circuit Court by the state attorney of this county." 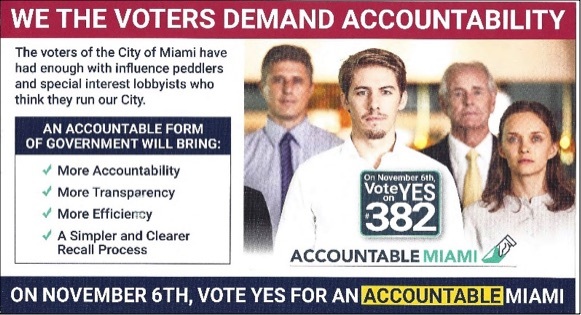 Given that the Ethics Commission has a long, and well documented history of refusing to go after the top elected officials in Miami-Dade County and the City of Miami, the most logical way for this issue to be put in the lap of the State Attorney, who rightfully is the one who should have been dealing with Carollo's antics from the beginning, would be for the City Manager, as the Chief Executive Officer of the city to write the State Attorney informing her of what Carollo was up to and asking her to investigate. As you can see from his response above, he hasn't done so. 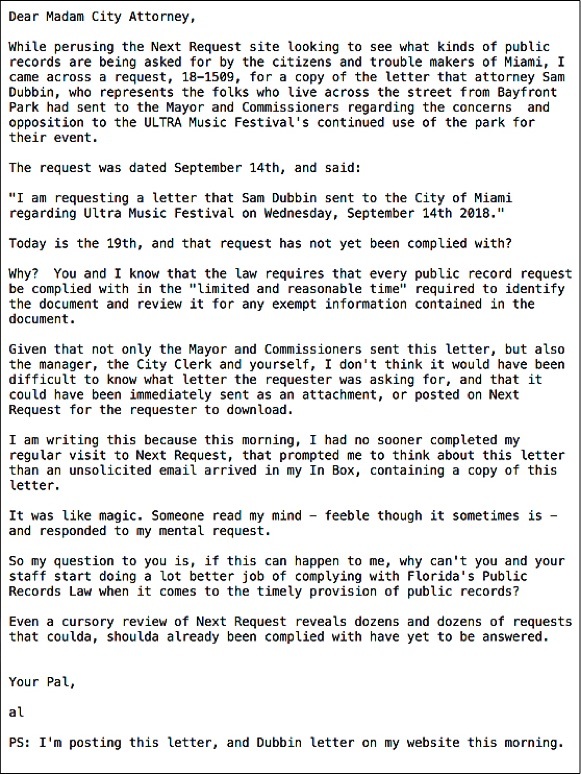 This email was sent to Victoria Mendez, the Miami City Attorney this morning. Here is Dubbin's letter and attachments. WHAT HAPPENED TO THE BLACK FOLKS IN THE CITY - DON'T THEY RATE THEIR OWN MAILER? On Monday I wrote a story about the Suarez campaign for Strong Mayor sending out their first mailer, and how they used a stock photo of serious white folks giving the readers the evil eye. 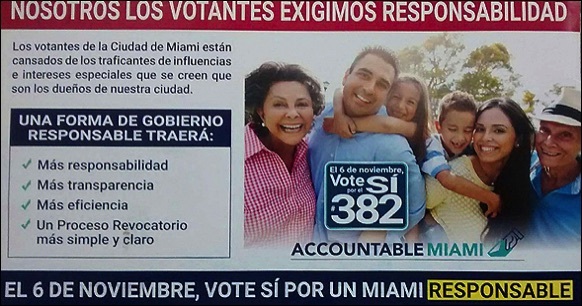 After my story went out, several Crespogram readers sent me the Spanish version of the mailer, with a different stock photo of what was obviously a stock photo of a smiling Latin family. 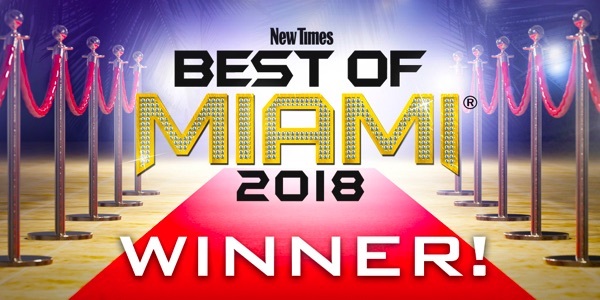 That prompted me to send out a twitter request to see whether the black folks in Overtown and Liberty City had gotten their own version of the mailer, and I even sent an email to the campaign asking them if they had sent out a mailer to black folks? 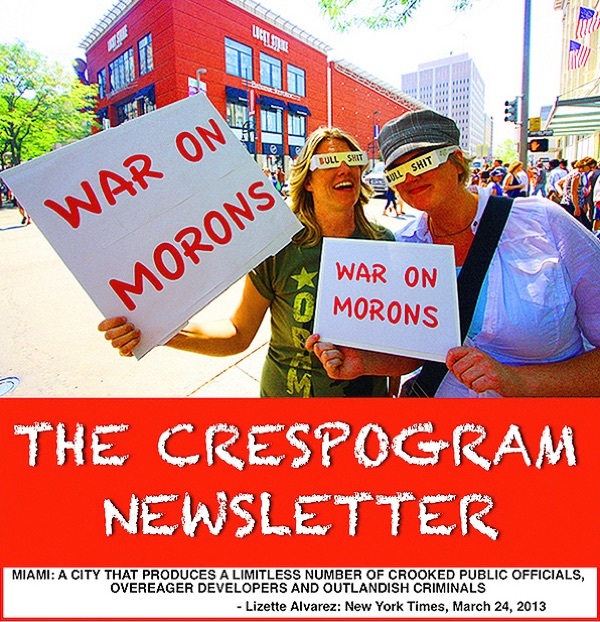 I've not gotten back one response, and in fact one Crespogram reader in Overtown wrote to tell me they had checked with neighbors and looked for these mailers in the usual places where one would normally expect to find them in Overtown and none were visible. Maybe that means that the Suarez campaign figures they don't need the Black vote for the Boy Mayor to become the Strong Mayor?